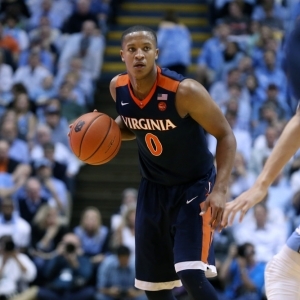 It looks like the Virginia Cavaliers are going to win the ACC regular-season title. They sit atop the conference at 13-1 and have defeated conference rivals UNC, Duke and Clemson. The rest of Virginia's conference schedule appears, on paper at least, to be quite easy, with the only exception being a visit to Louisville on March 1 to take on the Cardinals. Virginia has become a perennial contender for the ACC title thanks to coach Tony Bennett's excellence in defensive schemes and talented recruiting. However, the Cavaliers are looking for much more than just the ACC crown. The Cavaliers do not have much of a reputation when it comes to NCAA Tournament time, you know the period of time we all love and know as March Madness. You do not have to go back any further than last season when the Cavaliers put up all of 39 points and were eliminated in the second round. However this season's team is far different than last year's was. This year Virginia has an offense to go along with the best defense in the nation. The average scoring margin this season is six points higher than it was last season. The Cavaliers depth last season was not bad, but the only reliable scorer was London Perrantes. However, this season, with Perrantes now in the NBA, other players have stepped up on offense, giving the team more options with three players averaging 9.0 points or better, while last season Perrantes was the only player who did that. This helps in two ways. If one player is having an off night then two others can step up their game and carry the load and opponents cannot just focus on shutting one player down as they often tried to do last season with Perrantes. Sportsbooks are beginning to take notice of the way Virginia's "pack-line" defense shuts down opponents to the tune of allowing just 52.7 points per game, which as referred to previously is No. 1 in the nation. The defense has held opponents to 50 points or less 12 times this season. Oddsmakers currently have the Cavaliers at +600 to win the national title, which is tied for the third-shortest odds to win the National Championship. Virginia started the regular season at +7500 to win the national title, and anyone who took the Cavaliers at that long shot line is feeling better and better each day. The only two teams with shorter odds are the Villanova Wildcats and the Michigan State Spartans. Both teams have seen stretches of poor play, but both have returned to the top of oddsmakers' boards. Villanova has been near the top of the futures board for the entire season. However, the Wildcats were knocked off their perch last week when St. John's upset them 79-75. Villanova entered that game against the last-place Red Storm as 16-point chalk at home only to see St. John's win outright and cover by 20 points. Villanova then lost to Providence on the road, 76-71, sandwiched between wins over Butler and Xavier. Villanova defeated a red-hot Xavier on Saturday in a Big East showdown 95-79, inching closer to first place in the conference and trailing the Musketeers by just a half game at 24-3. Michigan State showed it has heart as well as talent on Saturday in rallying from a deficit of 27 points to beat Northwestern 65-60 and take a half game lead in the Big Ten. The win was the 10th straight for the Spartans. Since the beginning of the regular season, the Spartans have been at or near the top of the futures board opening the regular season at the top with Duke as +400 co-favorites to win the title. Although Michigan State has now won 10 straight, the Spartans have had trouble finishing off opponents, winning by five points or less in four of their last five outings, including Saturday's five-point comeback win. Let's not forget about the Duke Blue Devils. Co-favorites to win the national title to start the season, Duke is now at +600, just behind the Spartans and Wildcats. However, the Blue Devils have been inconsistent at times, but no one can count them out with Coach K. is sitting on the sidelines. Duke did lose to Virginia in a battle of ACC heavyweights on January 27, 65-63, as 3.5-point home chalk. The Blue Devils also lost to St. John's and North Carolina last week before beating Georgia Tech and Virginia Tech, and on Sunday they beat a tough No. 11-ranked Clemson team. A dark horse this season on the futures boards is Purdue. The Boilermakers are +750 to win the national title, but they have lost three straight Big Ten games and the pressure may already have become too much for the team. Their odds should balloon a bit when the next set of futures is released. After the Boilermakers, there is a big disparity in odds, with the next closest held by Arizona and Kansas at +2000, followed by Xavier at +2200.